General Description:Yellow hawkweed is a perennial with fibrous roots and rhizomes. Plants grow up to 35.4 inches tall (90 cm.) and exude a milky juice when injured. Flower Description: Flowerheads in compact, flat-topped clusters of 5 to 25 (or more). Flowerheads composed of all yellow ray flowers with fused petals into a strap-like shape. Bracts at the base of flowerheads with simple, stellate (star-shaped) and glandular hairs. Leaf Description: Leaves all basal except for one or two stem leaves. Leaves covered in hair with the upper leaf surface having long simple hairs and possibly a few stellate (star-shaped) hairs. The lower leaf surface has simple, stellate and glandular hairs. Stem Description: Stems grow up to 35.4 inches tall with lower stems having dense simple, stellate (star-shaped) or glandular hairs. Fruit/Seed Description: Achenes (seeds) with white bristles (pappus). Yellow hawkweed is a prolific seeder. It's an aggressive competitor of pasture and range plant species. It is destructive in rich pasturelands and may even invade cultivated fields. 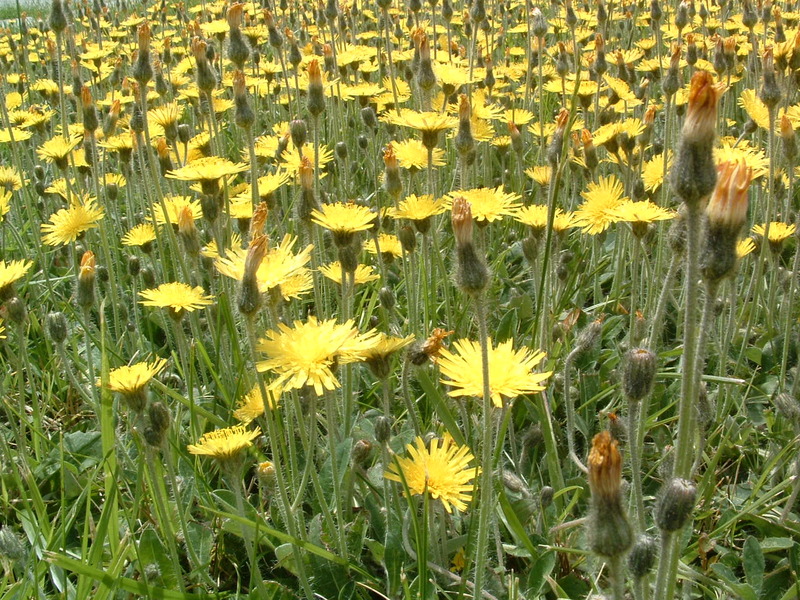 Yellow hawkweed is unpalatable and crowds out more desirable forage.